Creede, the only incorporated city in Mineral County has a population of 290. In its lucrative mining days, it was home to 10,000 people. The silver mines operated from 1890 to 1985. The town is located in a rugged wilderness area with many outdoor activities available. We rented a house through VRBO, and it was fantastic. The house, perched up on the hillside along with a few others, overlooks Creede. The views are wonderful. Wheeler Geologic Area is an eroded outcropping of volcanic ash which is a result of eruptions from the La Garita Caldera approximately 25 years ago. The area was Colorado’s first National Monument, receiving the designation in 1908, but such designation was removed in 1950 due to its remote location. The area may be reached in three different ways: in a HIGH clearance vehicle or RZR, on horseback, or by foot. We took the hiking option on foot. We followed a five mile trail and connected to the last two miles of the 4X4 road. This seven mile hike only got us to the trailhead near the hoodoos. For any view of the hoodoos, we needed to hike another mile. With our eight mile hike in and knowing we had an eight mile hike ahead of us to get out, we simply rested for lunch with a nearby view and didn’t really explore the area. If I had to do it over again on foot, I would consider backpacking in and spending the night in order to enjoy the area the following day. Not because the trail to the eroded rock formations was hard, but because it was long. In addition, much of the forest is dead from beetle kill, so the most interesting part of the hike not counting the pretty creek, wide meadow, wildflowers, and small aspen grove are the hoodoos. For eight hours of hiking (which included an hour in the rain), we didn’t get to spend as much time exploring the rocks as I would have liked. As such, I would consider going on horseback or renting a RZR. I understand the road is VERY rough, so not being an expert off-roading driver, I’d probably save my SUV for other trails. This geologic area is very unique for Colorado, so it was worth a visit, but the Badland’s in South Dakota might be easier to reach! Of course, if an endurance test is in order, this is an interesting location to visit. I’m glad we went, but I wouldn’t give it 5 stars (mostly due to the surrounding dead forest). We found a “five mile” hike from Lobo Overlook on the Continental Divide Trail listed on AllTrails.com. I was slightly suspect about the even number 5 on a trail that is over 3,000 miles long. I wondered if we’d end up at an obvious destination or if we’d be turning around at a random point. It turned out to be the latter, though we added another mile just for a nice view in the meadow to have a snack. It turned out to be a good stop as we spotted some deer enjoying a snack too, but overall it would have been nice to know had we added about 4 miles to our roundtrip for a total of 9 miles, we would have been eating lunch at Rock Lake! We found out about Rock Lake when we passed by some hikers on our way back who asked if we hiked all the way to the lake…bummer to miss! Lots of deer on this trail! This trail is near Wolf Creek Pass. The trailhead includes a bathroom, picnic area and a nice overlook near a radio tour, thus it invites some tourists (many of whom only walk a short distance anyway). The easy trail is dotted with wildflowers and provides sweeping views of the surrounding mountain ranges. Unfortunately, much of the forest suffers from beetle kill, but it is a good “pick your distance” out and back trail. I’m sort of a fascinated by the silver and gold mining days. Not only do I like to look at the old structures and see the shafts, it is hard for me to imagine what it must have been like to move west in hopes of striking it rich. It is hard just to climb the Rockies with fancy backpacks. Forging trails, digging holes, pulling out ore and sorting through all the tailings just to be shot in a saloon seems challenging at best. Anyway, driving the 17-mile Bachelor Loop lets visitors see the remains of several old ghost towns and mines that once boomed during the silver mining days. Tip: If pulling off the main road to read the Bachelor Loop sign, be sure to return to the main road and don’t mistakenly follow the 4×4 road to the right! My personal favorite is the Commodore Mine, located at the very beginning of the loop. The enormous structure spans the road and is perched up on both mountainsides. A picture can’t even do it justice. The Weaver Townsite, Amethyst Mine, and Midwest Mine all include nice structures as well. We continued on to see the Equity Mine which was very out of the way and we never found. We later heard it was a hole in the ground, so I recommend skipping #10 unless a leisurely scenic drive is the goal. Further around the loop at #11.5 is the Last Chance Mine, the highest operating amethyst mine in the world. We didn’t know we were visiting a mine in production when we stopped. To me, this place was fantastic. (More about it to come later in the post). We finished off the Bachelor Historic Loop by visiting the church and cemetery located on top of the hill overlooking downtown Creede. It was very close to the VRBO that we rented for the weekend. Bob Ford, the man who shot Jesse James, was once buried here though his remains have since been moved. There are many other historic and crumbling headstones from the mining days. Prospector Renniger had been searching for silver north of Creede. He was about to give up when Ralph Granger and Erick Von Buddenbrock gave him $25 and three burros which promptly ran off. Once he finally found the burros who wouldn’t move, frustratedly he began picking at rock where he found them. It turns out, he struck the northwest extension of the Amethyst Vein. With the opening of this mine, the silver production from Creede doubled in a year. Granger bought out the interest of Von Buddenbrock and Renniger and became the sole owner of the mine. Overtime, Granger passed the mine down to his family members. His granddaughter Nancy eventually sold the mine for its assessed value in 1995 to Jack Morris. In 2005 Jack Morris reopened the mine! All visitors get an account of the mine upon entering the parking lot. The mine includes a jewelry store and museum free of charge. It also has three rustic cabins that can be “rented” by donation only. Being a rock hound, I’m saving the best for last. The mine offers tours on the second level of its thirteen. All the levels’ entrances had collapsed, but they dug out the entrance on level two where we were able to walk a ¼ mile into the mine! We saw rare white turquoise, copper, silver ore and amethyst. We learned that silver and amethyst are indicators of each other. I really enjoyed see how the miners worked…standing on logs wedged high up in the rocks as the picked at the clay like substance in which the silver ore lies. I was even more amazed that the mine is now mining amethyst and visitors may sift through the tailings in search of different rocks and minerals. The fee is $2/pound for anything taken home. I now have some amethyst and silver ore!! We spent far more time here at the mine than expected. The Silver Thread Scenic Byway travels 120 miles past historic districts such as Creede and Lake City. The byway offers fantastic views in the area. 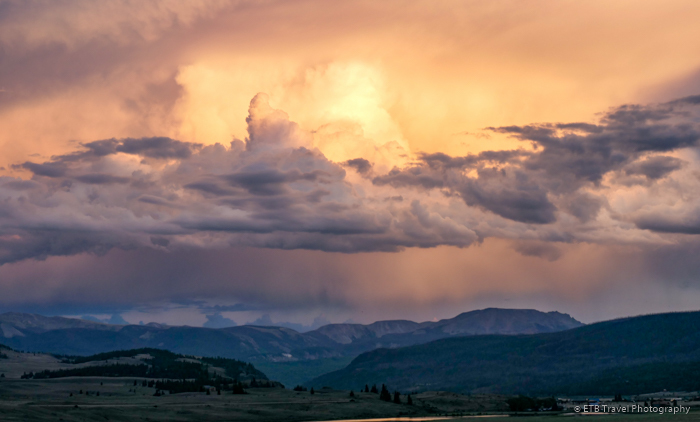 We only traveled a portion of it while going to visit South and North Clear Creek Falls, but found ourselves pulling over in several places to admire the spectacular sunset in the surrounding mountains and valley. Downtown Creede is small, but it is home to several cute shops, a coffee shop, a world famous theater and a handful of restaurants. I particularly liked the chocolate shop and a place called Rare Finds that had some cool kaleidoscopes among other things. One morning, we stopped at Coffee on the Fly, a coffee shop on one side and a fly fishing outfit on the other. They didn’t open until 8am on Sunday morning, so coffee addicts lined up outside the door! The freshly baked cinnamon rolls smelled awesome. After one of our hikes, we stopped at Tommyknocker Tavern for BBQ and happy hour. The meats and grilled cheese were good. The coleslaw was little to be desired. Other things to do in downtown that we didn’t fit into our schedule are to see a play at Creede’s famous theater or to see the Underground Mining Museum which is a museum blasted out of solid rock cliff! The gem shop also offers “hunting for gems” tours on the mountainside. An old friend I knew from competing at horse shows years ago, KK Christie, now manages Cottonwood Cove Guest Ranch just outside of Creede. It’s a popular place for the summer and draws the local church crowd in for their hearty brunch. I was expecting an options of eggs or salad, but it was a brunch of full on southern cooking. We didn’t hike long enough to earn a platter of fried chicken, fried catfish, pot roast, or chicken tenders. I’m a sucker for waterfalls, so when we found out some were nearby, we headed that way. We skipped the first exit to North Clear Creek Falls which is a four mile dirt road and continued to the campground where the smaller South Clear Creek Falls is located. After climbing around the rocks near the falls, we continued on to the second entrance to North Clear Creek Falls which tumbles into a gorge. It is home to the rare black swifts that nest in the mist of the waterfall. We enjoyed both stops late in the day. WANT TO VACATION SOONER? IF SO, THIS VACATION CLUB IS FOR YOU! For notecards and key chains, visit My Shop on this website or Etsy. For other products and digital prints, visit My RedBubble Products and my portfolio 123RF. Get Your Vietnam Visa Here!